This short report is based on field observations and research inside Iran and paints the picture of the situation of Afghan migrant workers in Iran and the continuation of their exploitation. S. Eghbal – If they find work, they will be paid much lower wages compared to their Iranian counterparts. In order to find work they are forced to pay off Iranian superiors or bribe the police who persecuted them. They live in the worst living conditions possible in temporary shacks or group homes. If they want to visit their families, they can only do so by paying smugglers who transport them across to Afghanistan and then back to Iran – this is the typical story of Afghan migrant workers in Iran. The population of Afghan refugees in Iran is estimated around three million with only 500,000 registered refugees – many of whom have to renew their status and pay the re-registration fees annually. This system of registration dates back to 2003 when the Iranian Bureau of Alien and Foreign Immigrants’ Affair (a Bureau within the Interior Ministry) re-registered Afghan nationals who had migrated to Iran in 80s and 90s. Since this initial registration, the newer waves of Afghan migrant workers have been registered more than ten times but each card is only valid up to a year. Therefore many of those who come to find work do not even try to apply for temporary residency status card – a process that the refugee has to pay fees for and carries the risk of deportation. As a consequence of Afghan nationals looking for jobs inside Iran and as consequence of Iran’s rigid system of work permits for foreign nationals, Afghan worker without passports have no choice but to rely on people smugglers for their transportation in and out of Iran. The people smuggler’s fee is around $600 each way, per person. Passing through known and unknown mountain roads, often takes more than four days and refugees risk their lives as armed Iranian forces do attack those crossing the border illegally. 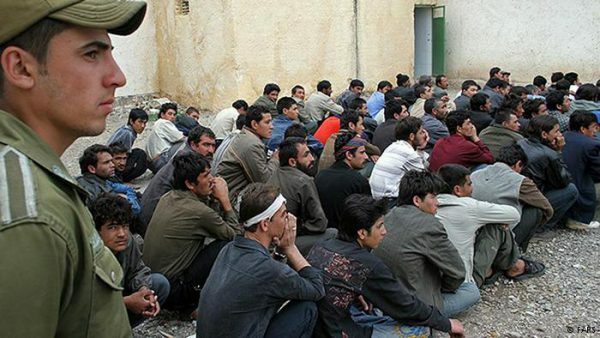 Migrant workers pay the fees; they are them jammed into vehicles and carriers and subsequently accept all illegal border crossing dangers in order to find work in Iran – a country that is home to more than six million unemployed Iranian citizens. Although the influx of Afghan migrant workers is continuous, estimates show that of the three million Afghan nationals who are residing in Iran around 1,800,000 are migrant workers. Of those around 250,000 have temporary residency cards or work permits issues by the Ministry of Labor and Social Affairs. Among them around 15,000 have insurance benefits covering medical bills and employment insurance. Most migrant Afghan workers in Iran are employed in legal jobs but under illegal circumstances because they do not have work permits. As such employees abuse them for this venerability and pay them wages that are lower than their Iranian counterparts’ average wage; they also devoid Afghan workers of the right to have employment insurance. 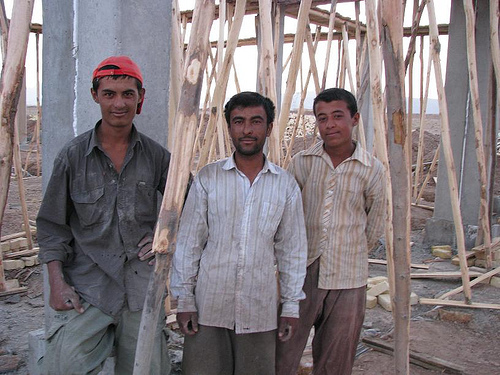 The Iranian housing and construction sector, in spite of the economic recession is contingent on the quality of work and low wages of the Afghan migrant workers. Afghan workers are more likely to accept hard labor at low wages compared to their Iranian counterparts. For example commercial and residential sewer system in urban centers like Tehran and sewage wells in other cities are mostly constructed by Afghan workers. Well drilling and related work is generally dominated by Afghan migrant manual labor and employees actually prefer the quality of work of Afghan well drillers. Afghan migrant workers are also preferred in fine interior decorating jobs including plastering, tiling and painting. Large numbers of Iranian laborers are abandoning construction industry everyday and Afghan workers are taking their place. As such, Afghan workers are serious competition in Iranian labor market. Afghan immigrant construction workers are never offered employment insurance. They do legal work but without residency or work permits, their work is considered black market labor. The employees do not face any penalization for hiring migrants but they do not give illegal workers their legal rights. Some Afghan workers in Iran are offered unsanitary, unsafe and temporary shacks or tents on construction sites to live. This is an arrangement they prefer as they do not have to pay for rent living in shacks on construction sites or other work environments like factories or agricultural fields. In urban centers like Tehran, Afghans mostly rent a space in overcrowded group homes. These group homes are very often located in the slums where the landlords make more profit by renting out rooms to groups. These group homes and apartments are managed communally and they can be found in the streets leading to Imam Hossein Square, Afsarieh, Farahzad and Shoosh Square in Tehran. Living together communally has benefits for the migrant workers as well. They pay less rent and they form networks. The network is often instrumental in employee referrals and finding jobs. Sleeping space is scarce in these group homes and workers have to manage their sleeping times with their shifts or take turns sleeping. Because they are less likely to be able to sleep and relax in the small space they share, one will find many books in these homes where Afghan migrant workers spend their resting time reading. On average an Afghan migrant worker’s monthly income is around $350-$400. This money is spent on daily costs of living, rent and transportation and the rest is sent back home, if the worker is lucky. Aside from the $600 that the migrant workers pay smugglers to enter or exit Iran, they also have to bribe police both in cities and in between cities. Police forces actively seek to arrest Afghan workers to receive bribe money. City police often know where the group homes are. They frequently raid these homes, arrest and charge Afghan workers and on the spot they become judges and perform a mock courtroom style sentencing. Of course the arrest, charging and sentencing is all a scam. The police are after bribe money and after they receive a share from the inhabitants of the group home, they leave them alone. Many months come that the Afghan workers cannot send money back home because they had to pay the smugglers and bribe the corrupt police. Unregistered afghan refugees cannot open up bank account or even purchase a mobile SIM card for cellular phones. It is also impossible for them to board the train and plane, as they do not have the national ID card required for all aforementioned. Refugees often rely on their Iranian friends’ identification cards to open bank accounts or to purchase cellular phone services. Access to air and train transportation is completely banned for illegal migrants and ground transportation is also limited to car sharing, private taxis or buses. Those Afghans who have residency status in Iran or have Afghan passport do not have a problem crossing the border. However, those who do not have passports or who cannot apply for passports in Afghanistan are often the ones who are stuck with people smugglers for their border transport. These include child laborers who cannot obtain an independent passport in Afghanistan. It also includes those who have not completed their military duties in Afghanistan and have come to Iran to work. It is not only the freedom of movement that is limited for Afghan migrant workers. While in Iran their social and romantic life is also very limited. Afghan men cannot marry Iranian women and if they do, their children cannot have Iranian citizenship. Aside from laws regulating marriage to alien nationals, socially too there are many restrictions on Afghans dating Iranians. An Afghan migrant worker can easily be reported for dating an Iranian woman in the neighborhood because the men in the neighborhood frown upon such relationship. All these discrimination against Afghan migrant workers are happening despite the fact that the Iranian ministries and government institutions are unofficially supporting the influx of migrant workers. The Iranian government saves more than 600 million dollars annually because of the cheap labor of Afghan workers. As such discrimination continues on a social level yet the double standards also continues and the Iranian market welcomes the Afghan migrants’ cheap labor even if it means child labor.